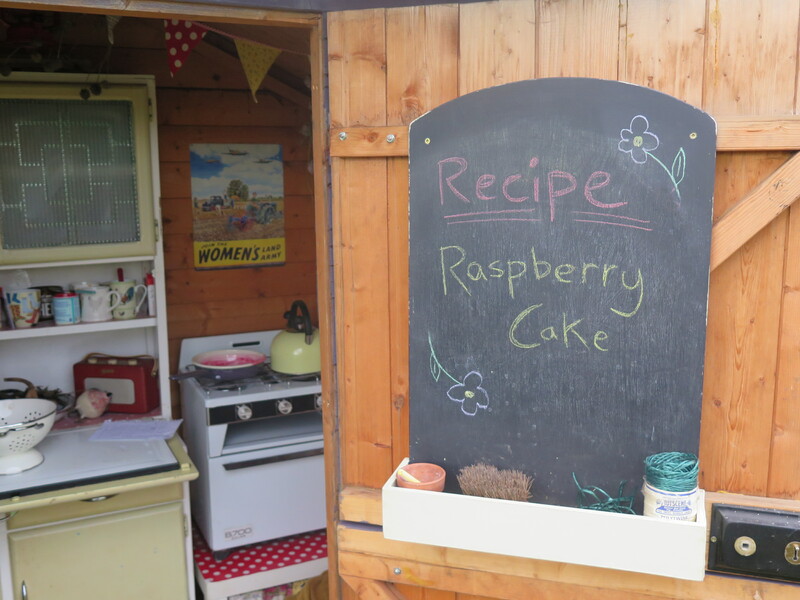 Raspberries just so happen to be one of my favourite things to grow on plot 15c and cake just so happens to be one of my favourite things to eat… so what better thing to make then raspberry cake?! 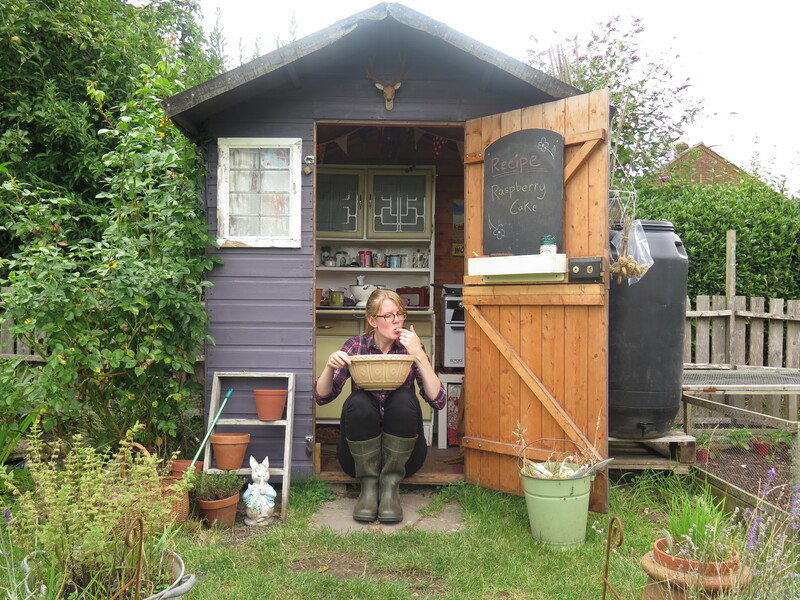 My Autumn fruiting raspberries are cropping like crazy now and I’ve simply been adding the odd handful to bowls of yogurt, ice-cream or on my morning cereal. I’ve been patiently waiting for the day when I harvest more than a handful to actually make something with them… And that day came! This recipe is simple and easy but most of all delicious. If you don’t have any raspberries then head down to the supermarket to stock up, you can also buy ready made raspberry sauce to use instead of making your own too. 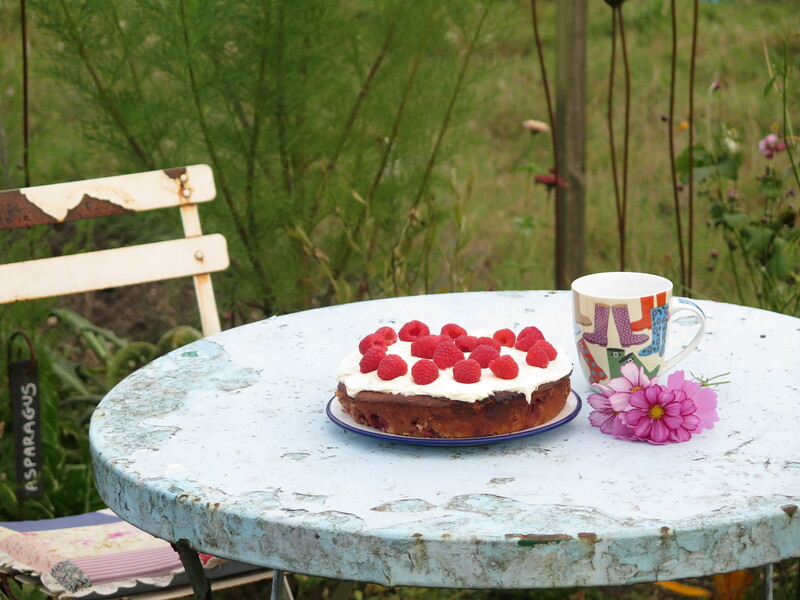 Just a quick note, because we are using fresh raspberries the cake will need to be eaten within a couple of days… although I doubt it will last one whole day in our house! Makes one 8 inch round cake. Fry 200g of raspberries in a pan for a few minutes to help break them up. Transfer to a mixing jug and use a hand blender to create the sauce. If you would like a smoother mixture then pour the sauce through a muslin lined sieve, but I like to use the sauce with all the yummy bits in! Preheat the oven to 180c/gas mark 4. Cream the butter and sugar together until light and fluffy then gradually beat in the eggs individually. Add the flour and baking powder and combine thoroughly. Fold in 3/4 of the fresh raspberries and the raspberry sauce then spoon the mixture into a greased 8 inch cake tin. Bake for around 50 minutes or until the cake has turned golden brown. Cool in the tin then transfer to a wire rack to cool down completely. 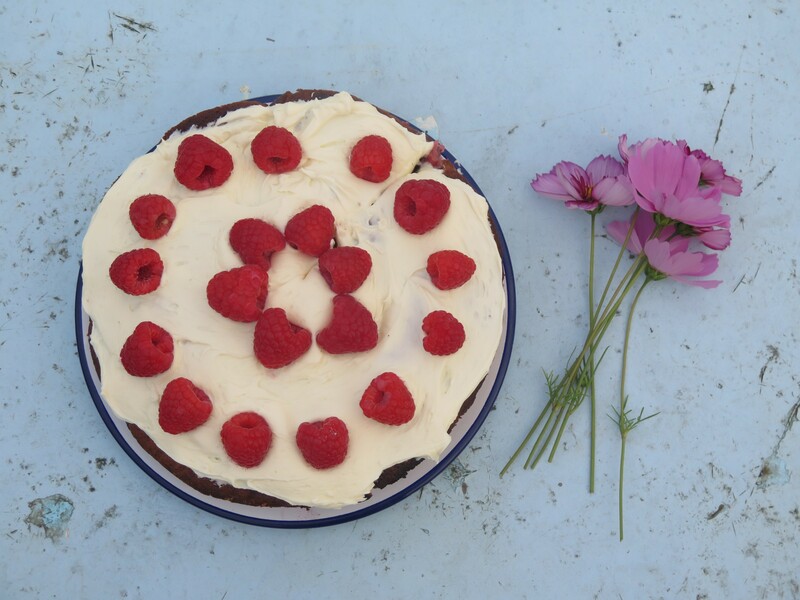 Spread buttercream icing on top of the cake, decorate with the rest of the fresh raspberries and enjoy! Looks delish! Think this would be perfect for afternoon tea! Going to bake this over the weekend using raspberries from my back garden. Thanks for the recipe.